How Long Will Supergirl Be In The Shadow of Superman's Cape? The new Supergirl TV show takes place in a world that already has Superman—and that’s a huge part of the show’s format. We know that the Man of Steel is out there, doing his incredible feats. So how long will Kara be feeling like second best to her cousin Kal-El? We asked the show’s producers at Comic-Con. 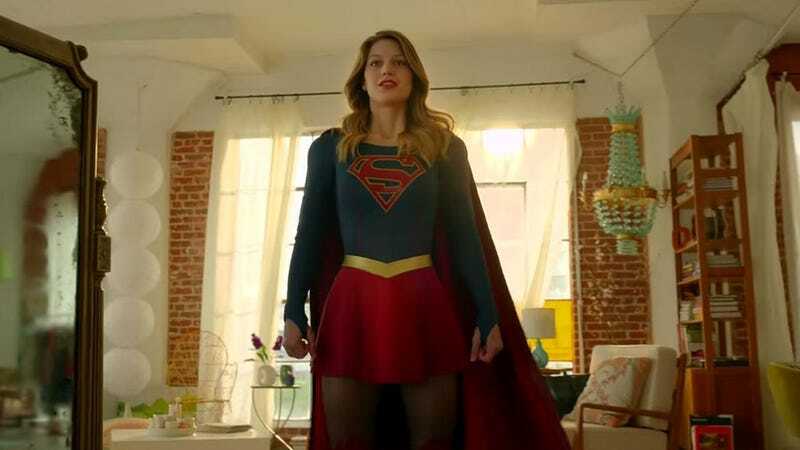 We took part in roundtable interviews about Supergirl this past weekend, and we were interested to find out just how the show will handle the Superman thing, going forward. Will she constantly be getting compared to Superman, and how much of a drag will this be? Will she be in his shadow forever? So maybe when Supergirl shows up to deal with a situation, we might see people ask, “Why couldn’t we have him? Why did it have to be her?” But Adler promises that, “over the course of the season and the series, that question will matter less.” Also, she hints that Supergirl’s powers may not be exactly the same as Superman’s—she probably has what he has, but we don’t know what else she might have. And Adler says that the special effects will be truly impressive in this series—there will be some amazing set pieces, she promises—but in the end, it’s all about the characters. I hope that young women and young men see her as just as powerful as the male heroes, so many times we’re breaking stories or we’re pitching stories, and people say ‘would she do that?’ And if it was a guy and we were pitching it, nobody would have even asked those questions. So it’s interesting how we’re all still asking some of those things, and it would be nice to sort of move on to whatever the next phase of all that is. Meanwhile, we also talked to Mehcad Brooks, who plays James Olsen, and who said this show has a great message for young women: “Live as who you are, be as big or as bright as you can shine.” When Brooks read the script, “I was tearing up a little bit,” because “that’s a struggle we’re all having: ‘Am I going to be my higher self, or am I going to hide?’” It doesn’t matter if you’re a man or a woman—this is a story about someone coming into their own, that everyone can relate to.